﻿ Jack the Lizard Wonder World - Let's Make an Action!! Peter Langen rescues injured or orphaned wild animals and release them to wilderness. 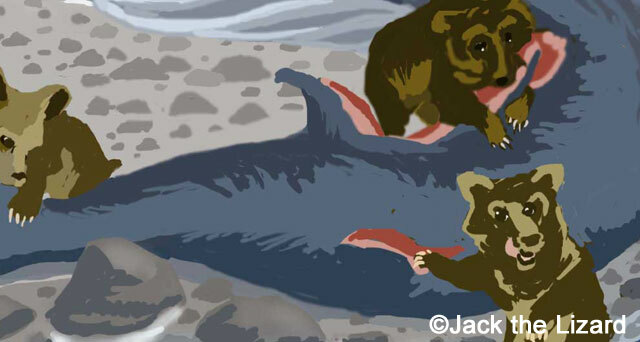 Jack visited him in Smithers, British Columbia in Canada. 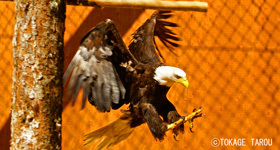 Gunther and Nancy Golinia rescue, rehabilitate and release thousands of birds and animals. Jack visited them in Prince Rupert, British Columbia in Canada. 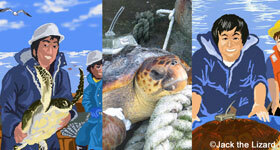 National Oceanic and Atmospheric Administration (NOAA) and the Port of Nagoya Public Aquarium have been conducting the program of satellite tagged loggerhead sea turtles since 2003. 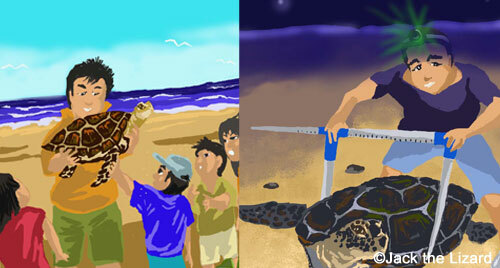 It is very imporant to understand the lifecycle to protect the seaturtle, which is one of the endangered species. In September 1989 Dr. Polovina advised anxious lobstermen on the harvest of spiny lobster in the northwestern Hawaiian Islands. 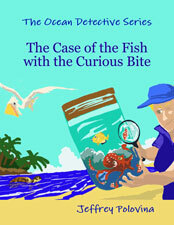 "Overfishing is obvious reason for a low catch in this season. 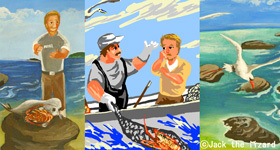 Lobsters will be back next year" What did actually happened in the pacific ocean? 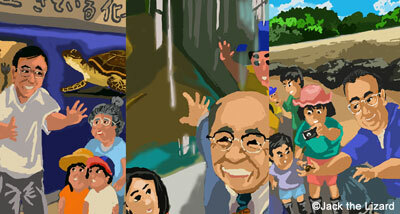 This is the story of Dr. Polovina's research. 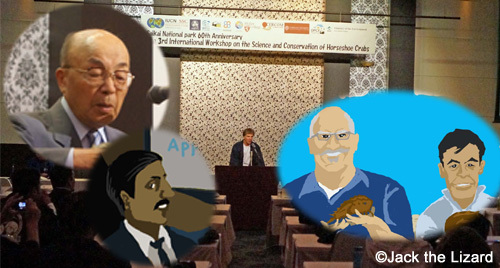 Scientist and conservationist around the world took part in Third International Workshop on the Science and Conservation of Horseshoe Crab. The workshop was conducted and participants had exchanged their scientific information and discussed how to save Horseshoe Crab worldwide. 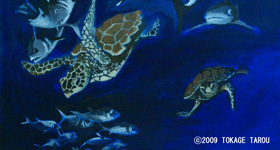 Loggerhead sea turtles are long-lived, wide-ranging species. They inhabit vast open ocean, therefore it is very difficult to survey their behaviour and habitat. However the satellite data provides special opportunity to observe their pelagic life. There are 7 kinds of turtles, Loggerhead turtle, Green turtle, Hawksbill turtle, Olive Ridley, Kemp’s Ridley turtle, Flatback turtle, and Leatherback turtle. 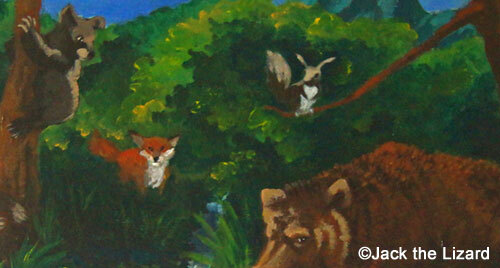 All of them are critically endangered. Jack the Lizard visited Port of Nagoya Aquarium, which is only the place where the breeding of loggerhead turtle is successful in Japan. Higuma Bear is the brown bear lives only in Hokkaido and the largest land mammal in Japan. Higuma Bear is the key species for the conservation because of its territorial broadness and food variety. Masahiko Kadosaki, Director of Hokkaido Wildlife Laboratory tells us about Higuma Bear and wildlife in Hokkaido. The Sea Turtle Association of Japan was also established in 1990 by Naoki Kamezaki who is the chair man of this organization now. 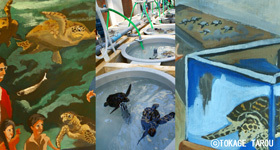 STAJ held the first sea turtle conference in Kagoshima and since then the conference has been held every year. Rausu town is very unique place in which people and brown bears share the land in Hokkaido, Japan. The town is located at the tip of Shiretoko peninsula in Hokkaido. Since there is still an abundance of wilderness and wildlife, the Shiretoko was designated as the World Natural Heritage Site in 2005. Mount Iwaki is one of the top100 Famous Mountains higher than 1,500m in Japan. The mountain is the scenic symbol of Hirosaki city in Aomori prefecture. Mt. 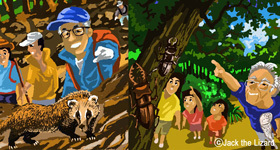 Iwaki Conservation Association was organized to protect and introduce its beautiful nature. Now the association has about 360 members not only from the local area but also from all the regions in Japan. In 1994, the Ministry of the Environment banned the Asian black bear hunting in Hyogo Prefecture. The by-law was passed by high school students and their teacher. 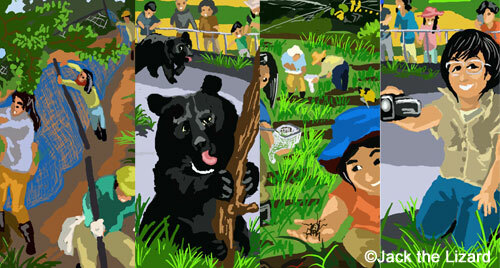 In 1997, Japan Bear & Forest Society was established by Ms. Mariko Moriyama in Nishinomiya City, Hyogo Prefecture. 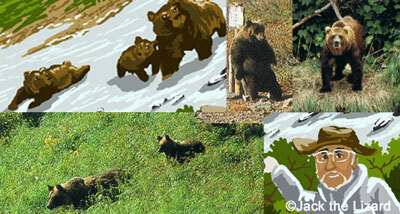 Higuma, Japanese brown bears are found only in Hokkaido, Japan, the population is about 2300. 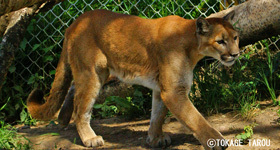 They usually stay in the forest and mountain area, but occasionally they are found in suburbs and even within cities. Those who come to human populated area are usually curious young bears, but they do not cause any troubles such as human injuries and fatalities so far. However, recent year in the mountain there are fatal incidents with bears. Although fatalities are quite low, people should be alert when they enter the bear country. In 1978, Japan Horseshoe Crab Conservation Association was established to educate people the importance of horseshoe crab and its conservation. The general office is in Kasaoka city in Okayama. The association has increased the members gradually, now more than 700 of the registered members to study the life of horseshoe crabs and conserve mudflats together with local volunteers. The environment has been dramatically difficult to live for amphibian. 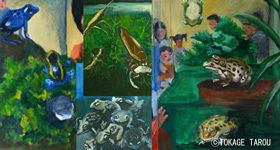 Amphibian Ark was leading zoos, aquariums and botanical gardens to initiate the campaign to protect amphibian and announced "2008 – The Year of Frog". Jack the Lizard visited Ueno Zoo, Tama Zoo and Inokashira Park Zoo in Tokyo.